Every year, tens of thousands of Israelis and Christian believers from around the world participate in the annual Jerusalem March, a festive parade that takes place in the middle of the week-long Sukkot holiday (the Feast of Tabernacles). It begins in the afternoon and participants include representative groups from different countries and organizations, dance ensembles, street artists, marching bands, IDF soldiers and others. 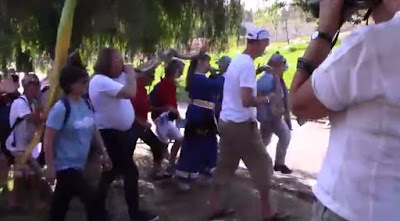 The Jerusalem March has evolved since its founding in 1955 when it was a four day march around the time of Passover that was attended by a small number of IDF soldiers and a few dozen local civilians. Following the founding of the Christian Embassy in Jerusalem in 1980, Christian believers began joining the march and over time it has become a tradition for thousands of Christians from around the world to participate while holding banners showing their love for the Jewish people and the State of Israel, wishing locals a happy holiday and giving bystanders little trinkets, such as flags from their home countries, and candies. We went to the finish line in Gan Sacher to record some of the marchers in their native costumes carrying the flags of their countries and singing songs in support of Israel. When people of FAITH come together like this, there is HOPE for our world!!! my kids who live there never mentioned this to me. never. hmmmm.